The WESPA Ratings Officer updates the ratings file using the latest results of approved tournaments. Rankings are given to those who have played in the past two years and have reached 50 games in WESPA-rated tournaments. Note that players with more than seven years of inactivity will retain their previous rating but will be considered provisional until they have reached 50 games in WESPA-rated tournaments after their return. The WESPA Ratings System is known as Aardvark and has been in operation in its current form from 28 May 2012. You can find historical tournament results as well as ratings information regarding specific players. The full list of players is not only available as a text file; if you are looking to search for a specific player (including yourself), our search tool below can assist. If you would like to stage an internationally rated tournament, first check the Criteria for WESPA Rated Tournaments (located on our Tournaments page) to determine if it is likely to be eligible. If you believe it to be exempt from application, forward details direct to the webmaster for inclusion on the calendar. Applications for rating a specific event which is not exempt are to be forwarded to your region representative or the Tournament and Rating Committee chair using this form. Once approval is obtained, check that your tournament appears on the International Calendar. If it does not appear within one week, contact the webmaster. WESPA can provide promotional assistance where tournaments are submitted with enough lead time to the event taking place. Dedicated webpages or flyers greatly assist with this. In addition, it is advisable, though not a requirement, to make a list of registered players available when known. 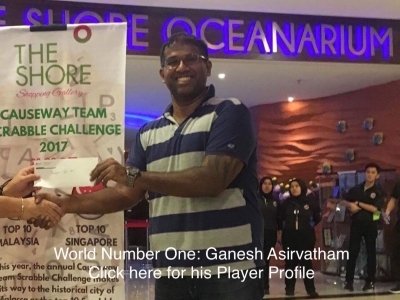 Results of the event in the form of a tournament file (*.tou) should be emailed the WESPA Ratings Officer Bob Jackman as soon as possible after completion of the tournament. For players who have competed internationally before, their names in the file must match those on the current ratings file to avoid them being treated as new players. If you are using the TSH software developed by John Chew, you should deploy the name checking routine when exporting TSH files to the required *.tou file. Both TSH users who do not run the name check and Aupair users should run a ‘TouFile Check’ to check the *.tou file against the existing ratings file and produce a list of exceptions. These should all be new players to the system. 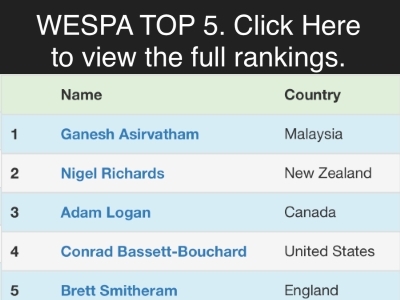 The WESPA Ratings Ratings Officer must be provided with the nationalities of players new to the Ratings system at the time the *.tou file is sent. Changes of nationalities or spellings of existing players should also be provided. NOTE: Further assistance for TSH users is available here. You may use the Website and/or Content solely for your own individual non-commercial and informational purposes. 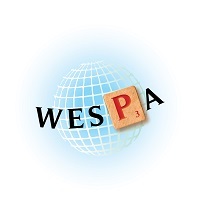 Any other use, including for any commercial purposes, is strictly prohibited without WESPA's express prior written permission. Systematic retrieval of data or other Content from the Website, including but not limited to scores, statistics, and/or rankings, whether to create or compile, directly or indirectly, a collection, compilation, database, or directory, is prohibited absent prior express written permission from WESPA.